Damon was born in Bloomington, Indiana. He made his acting debut in the February 3, 2009 episode of The CW's 90210, before getting minor roles in other television series such as Greek and 10 Things I Hate About You, and a recurring role in True Blood. In 2010, he landed a regular role as Hastings Ruckle in the final season of Friday Night Lights. The following year, he starred as Brian in The Nine Lives of Chloe King, which was cancelled after one season, and in 2012, he appeared in a recurring role in The Secret Circle. Damon had a recurring role as Archie in Freeform's Twisted. Damon played the main love interest of Destinee & Paris in their 2011 music video for "True Love". On February 25, 2013, he was cast as Grayson in The CW's drama series Star-Crossed (originally titled Oxygen). In early August 2013, it was reported that Damon would join the cast for American Horror Story: Coven. In 2016, Damon was announced as Mirror Master for The Flash season 3.He was later cast in the spinoff of Grey's anatomy, Station 19,as Jack Gibson who is in a relationship with Danielle Sarve's character,Maya Bishop. 2009 90210 Waiter Episode: "Help Me, Rhonda"
2009 Lincoln Heights Serge Episode: "With You I Will Leave"
2010 Greek Hunter Episode: "The Tortoise and the Hair"
2010 10 Things I Hate About You Trey Episode: "Meat Is Murder"
2010 The Whole Truth Todd Engler Episode: "Pilot"
2013 American Horror Story: Coven Archie Brener Episode: "Bitchcraft"
2017 The Magicians Dryad Episode: "Word as Bond"
^ Hibberd, James (September 15, 2011). "'Nine Lives of Chloe King' cancelled at ABC Family". Entertainment Weekly. Retrieved December 30, 2011. ^ Gelman, Vlada (October 24, 2011). 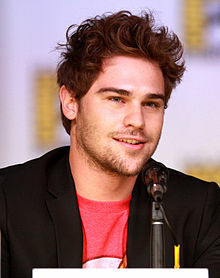 "Exclusive: Secret Circle Recruits Friday Night Lights' Grey Damon for Some Dark Magic". TVLine. PMC. Retrieved December 30, 2011. ^ Andreeva, Nellie (February 25, 2013). "ABC's 'Spy', CW's 'Oxygen' & Amazon's Onion Pilots Add To Casts". Deadline Hollywood. PMC. Retrieved August 9, 2013. ^ "'American Horror Story: Coven' Photos: Season 3 Set Pictures Emerge". The Huffington Post. August 1, 2013. Retrieved August 9, 2013. ^ "Destinee & Paris – True Love". YouTube. Retrieved October 27, 2018.